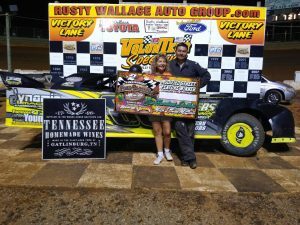 BULLS GAP, Tenn. (Oct. 6, 2018) — The Fall Classic on Saturday at Volunteer Speedway featured a much-anticipated Crate Late Model vs. Sportsman Late Model “Shootout” paying $1,500-to-win as the main event. 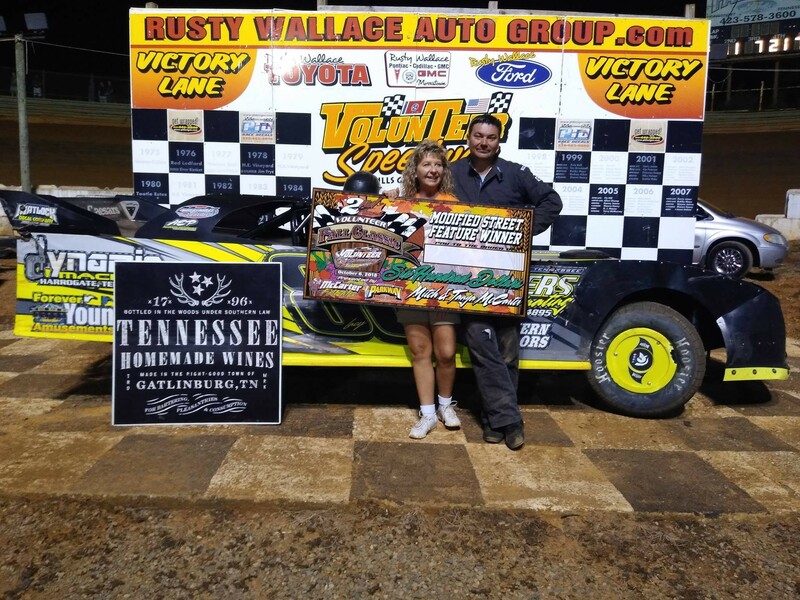 Three-time track champion Tim Byrd and Aaron Guinn of Russellville battled for the win, with Guinn taking the checkered flag over Byrd. … However, after the race runner-up Byrd protested the (sealed crate-engine) under the hood of Guinn. Guinn followed with a counter-protest of Byrd’s engine. Post-race technical inspection determined the engines for both Guinn and Byrd were legal. 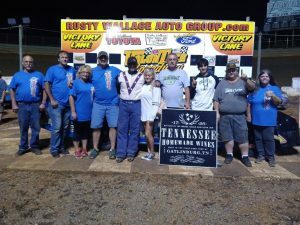 Brad Davis of Tazewell recorded the Modified Street win, while Wade Rookard of East Bernstadt, Ky., captured the Open Wheel Modified victory. 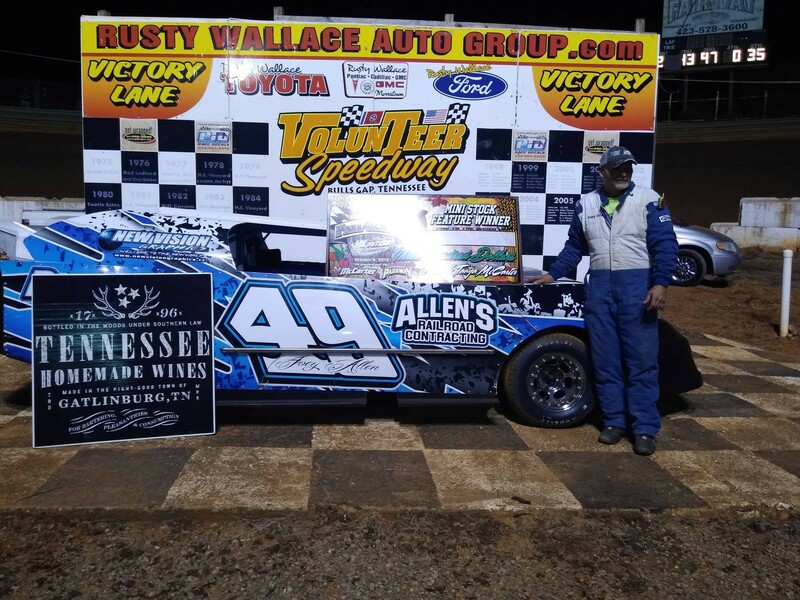 Josh Chesney of Maynardville captured the Classic victory, with Joey Allen of Cosby recording the 4 Cylinder win, while Rex Coffey of Morristown claimed the 602 Street Stock victory. With a strong lineup of 34 Crate Late Model and Sportsman Late Model competitors present, Byrd was fastest in qualifying at 13.287 seconds, with Zach Sise second-quickest at 13.437. The 24-car starting field was determined through four heats races which transferred the top six finishers from each. 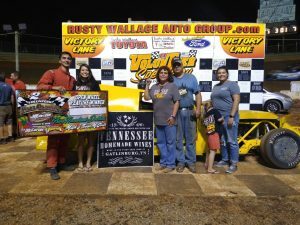 The races were respectively won by Byrd, Sise, Guinn and Travis Fultz. Byrd jumped out to the lead on the start over Guinn, Sise, Matt Tharp and Fultz. Fultz passed Tharp racing off the fourth turn on lap 2, and just three circuits later Tharp slowed on the backstretch and entered the infield pits in the third turn. While the action up front between Byrd, Guinn, Sise, Fultz and Tyler Arrington was intense, behind them it was action-packed involving terrific battles for position involving Rusty Ballenger, Trevor Sise, Tim Maupin, Heath Alvey, Adam Tolliver, Jed Emert, Jake Whitehead, Brandon Miller, Warren McMahan and Chris Coffey. Caution waved on lap 10 when Brad Seagle slowed with right-front suspension damage. Back under green off the double-file restart, Byrd pulled back out into the lead over Guinn. But the youngest of the Sise brothers, Zach, was experiencing power steering issues and quickly lost a couple of spots. 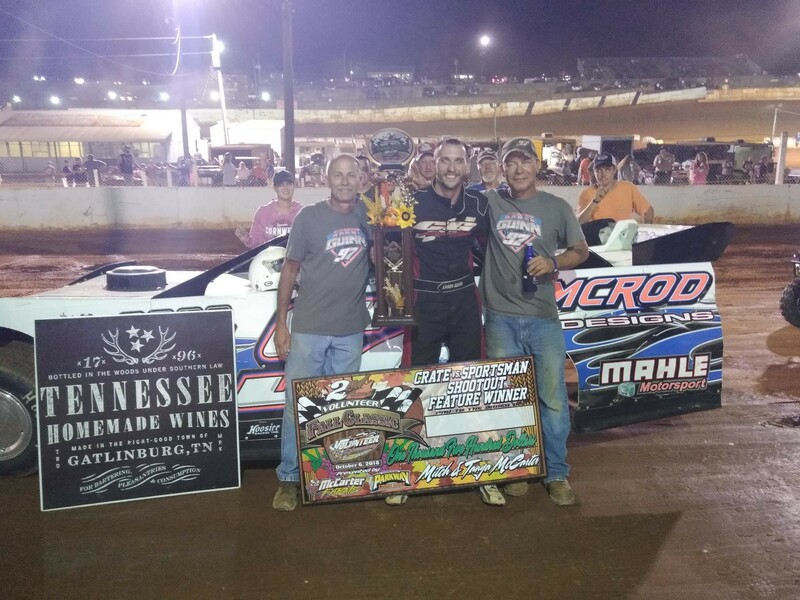 Zach and Trevor Sise got together between turns one and two on lap 11, which in turn stacked the field up behind them leading to a multi-car wreck collecting Alvey, Tolliver, McMahan and Tyler Smith – with the veteran McMahan flipping. The red flag was displayed to allow emergency and track personnel to quickly arrive on the scene to check on the drivers, and thankfully all were OK.
Off the ensuing double-file restart, Byrd and Guinn proceeded to battle side-by-side over the following eight laps before Guinn took the lead racing off the fourth turn on lap 19. A late-race caution on lap 25 when Emert slowed to a stop high in the fourth turn set up a five-lap sprint to the finish. With the green flag waving Guinn smashed the loud pedal to lead Byrd, and with a clear track ahead he sped to victory (pending post-race protest) over Byrd, Fultz, Ballenger and Trevor Sise. Completing the top 10 finishers were Arrington, Maupin, Whitehead, Miller and rookie Adam Ahl who was making his first-ever start in a dirt late model. Chris Rickett was fastest in Modified Street qualifying at 14.409 seconds, but it was Brad Davis powering out into the lead at start of the 20-lap feature. In the early going Davis looked like he was going cruise to victory. But behind him action back through the field was worth the price of admission as those in pursuit battled two- and at times three-wide around the high banks. 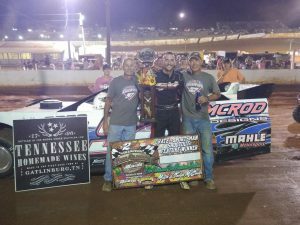 Davis had to hold off the hard-charging Chris Rickett and Robbie Buchanan to capture his fourth win on the season. Finishing fourth and fifth, respectively, were Gary Blanken and Michael Woods. … Closely following were Shannon Emery, Wayne Rader, Nick Presley, Eric Hux and Willie Busler, with the top 10 finishers all on the same straightaway. 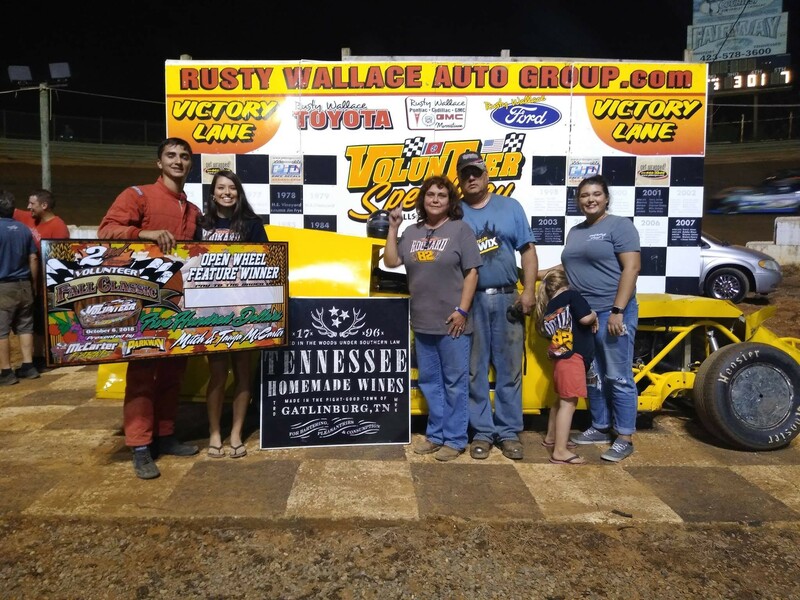 Wade Rookard grabbed the lead over Billy Palmer at start of the Open Wheel Modified feature and led flag-to-flag to record his first-ever win at “The Gap.” Rookard was chased to the checkered flag by Palmer, Tyler James, Terry James and Jeff Akard. 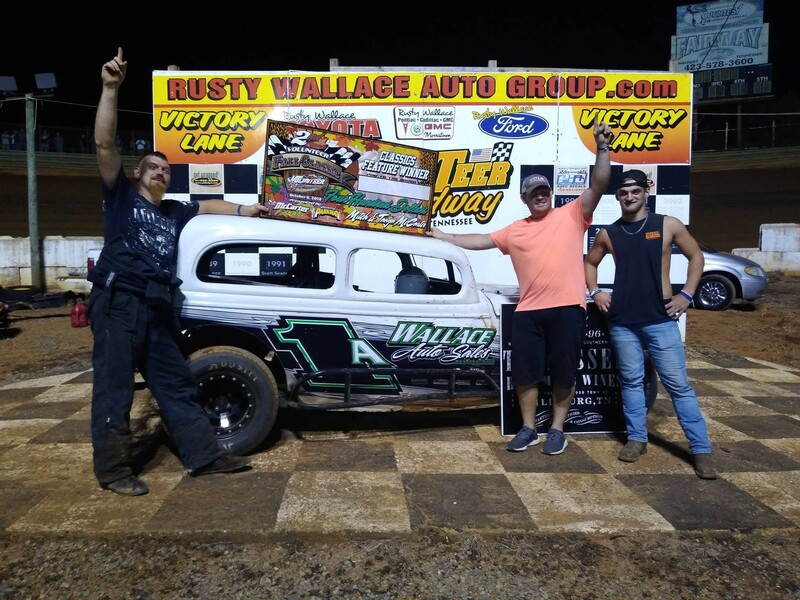 Josh Chesney jumped out into the lead on opening lap of the Classic feature and went on to record his third victory of the season over Shaun Sise, Lee Merritt, Michael Millsap and Rusty Welch. Joey Allen grabbed the lead at start of the Mini Stock feature and never looked back en route to winning over Hayston Collett, Chad Manning, Randy Dyke and Jarrod Wise. 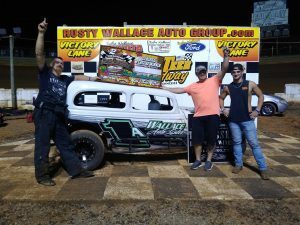 Rex Coffey captured his third straight and fourth overall 602 Street Stock win on the season by outrunning Josh Driskill, Shawn Henry, Brandon Johnson and Danny Tullock.